This is a quick and easy to make dessert. When you have guests at home in a short notice, this recipe helps you a lot. This is a simple recipe with very few ingredients. 1. Dry roast the wheat flour on low flame till you get a nice aroma. 2. Powder the sugar and cardamom into a fine powder. 3. Coarsely grind the nuts of your choice and melt the ghee. 4. 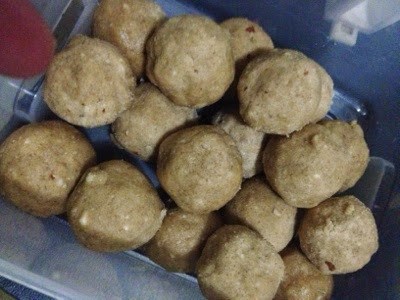 In a mixing bowl, mix the flour, nuts and sugar and by slowly adding the ghee, roll them into balls. 5. Let the balls stay for a while and serve it. This is a health snack as well as we add nuts and make it with whole meal atta. Enjoy!! !